Not even two great actors can save the Tower from falling. The long-anticipated adaptation of Stephen King’s The Dark Tower has finally made it to Keystone Earth (that’s our world, by the way), and most reviews paint the film as a total letdown — whether you’re a fan of the books or not. The movie captures neither the gravitas nor the horror of the original books in a much too short runtime riddled with confusion. Sure, all the characters and elements are there: Roland Deschain as the last Gunslinger, the young psychic Jake Chambers, the sorcerer known as the Man in Black (but also Walter), and obviously the Dark Tower itself. But whereas the book series is long, slow, and philosophical, The Dark Tower film suffers from faster pacing and a short runtime that will bewilder most. The film underutilizes the talented Idris Elba and utterly misuses Matthew McConaughey as the dueling leads, who both do their best with generally poor writing. Tom Taylor as the young Jake Chambers is perfectly adequate. That seems to be the consensus. For many of the following reviewers, The Dark Tower may have already fallen. Elba and McConaughey do the best with what they've got. Julia Alexander from Polygon called The Dark Tower “an example of how not to approach an adaptation,” saying that it’s “almost sinful that none of the unique story and world building King accomplished comes through.” Zealous fans of the book series hoping for a genuine continuation of the story instead get a paper-thin Dark Tower that crumbles under its own insubstantial weight. 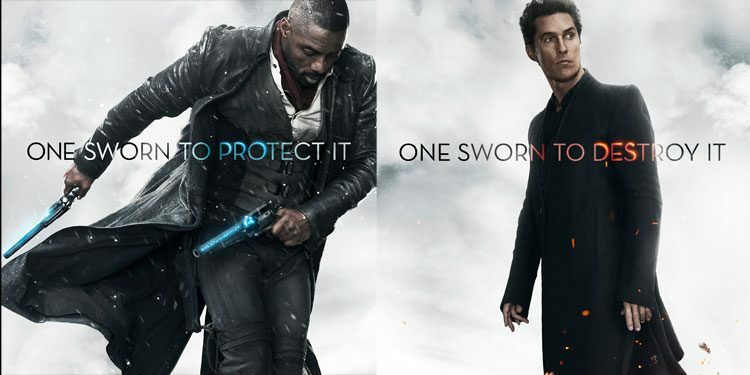 Gleiberman called The Dark Tower “a competent and watchable paranoid metaphysical video game that doesn’t overstay its welcome.” Yet still, the movie “summons an emotional impact of close to zero.” Elba does a good enough job of selling the growing sense of fondness that Roland has for Jake, but as McConaughey slays characters with his magic devilry with the flick of the wrist, we’re never sold on why we should care about any of this. Darren Franich from Entertainment Weekly is right to point out that Elba “looks good in anything.” Much of the film’s costuming is fantastic, especially with the suave and badass Roland, clad in a mash-up of noir, Western, and ronin attire. But you can almost see the black hair dye dripping from Matthew McConaughey’s forehead, “who spends the movie negging Roland via hologram, and using psychic kids to send glowing destructive brainbeams into the clouds, and talking way too much about how Jake’s shine is pure.” Some of these characters and situations are utterly ridiculous, but that’s okay as long as viewers don’t take any of this seriously. If the film has a strength, it’s when Jake recognizes the ridiculousness of this universe and the audience can laugh (unintentionally) at it. Ultimately, the consensus among reviewers seems to be that The Dark Tower is an emotionally shallow, fast-paced, and action-packed movie that feels more like a campy video game than it does anything reminiscent of Stephen King’s uber-serious attempt at a philosophical sci-fi universe.